Collaborative Project Management enables project teams to collaborate across departmental, corporate, and national boundaries and to master growing project complexity . ConceptDraw MINDMAP is collaborative project management software witch has powerful collaborative project management tool for presenting via Skype. This allows to implement successfully project management collaboration in really short terms. Collaborative Project Management via Skype mind map sample is created using ConceptDraw MINDMAP mind mapping software. This is the example of e-Business Strategy presentation for project team collaboration via Skype. 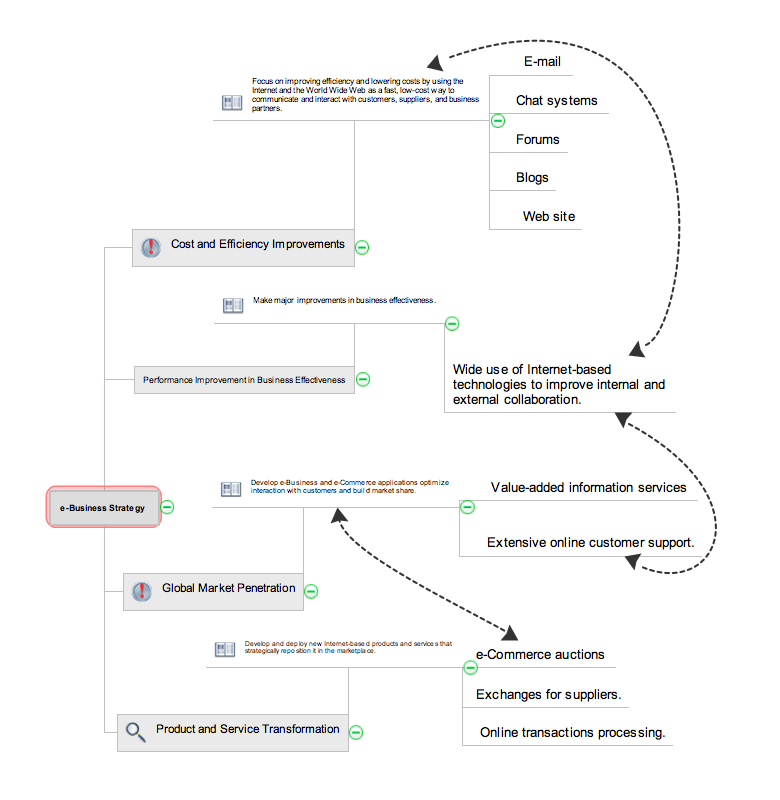 Use this mindmap sample for implementation of Remote Presentation for Skype solution from ConceptDraw Solution Park. A key point of conference success is the ability to see slides in real time, and hold documented discussions during the meeting. Remote Presentation for Skype is a new solution allows real-time presenting that benefits work groups who need collaborate by web meetings. Create a list of Tasks in Outlook using topic types "Task" from a MINDMAP document. A team briefing tool is an excellent way to enable communication upwards, downwards and sideways throughout an organisation. ConceptDraw MINDMAP v10 with the new Note Exchange solution allows to organize your ideas with MINDMAP and Evernote.